LE BOURGET, France, June 16, 2015 /PRNewswire/ — Boeing (NYSE: BA) today outlined its strategy as the company targets a second consecutive year of record commercial airplane deliveries. During a briefing at the Paris Air Show, Boeing Commercial Airplanes President and CEO Ray Conner also provided a progress report on the three programs still in development — the 737 MAX, 777X and 787-10. Conner also outlined progress on the company’s Airplane Development programs. For the first time, Boeing announced that the 737 MAX will roll out of the factory by the end of this year and fly for the first time early next year. “Performance of the 737 MAX is meeting all of our expectations, with the airplane being 20 percent more fuel efficient than the first Next-Generation 737,” said Conner. Conner said the 777X is on schedule to reach firm configuration this year, begin final assembly in 2018 and be delivered in 2020. The 787 will transition to a production rate of 12 airplanes per month in 2016 and 14 per month by the end of the decade. First delivery of the 787-10 is scheduled for 2018. Le Bourget, 16 June 2015 – ATR and Sweden-based Braathens Aviation today signed a contract for the purchase of 5 ATR 72-600s and 10 optional aircraft as part of the company’s fleet upgrade strategy. Deliveries will commence at the end of 2015. The new aircraft, which will seat 72 passengers, will be operated on the carrier’s regional services in Sweden.. The ATR 72-600 will join an existing fleet of 5 ATR 72-500 airplanes operated by Braathens Regional from its base at Bromma Airport (Stockholm City Airport). The new ATR planes will enable Braathens Aviation to press on with an expansion plan and replace aging Saab 2000 units, while its overall ATR fleet will grow. These new turboprops will benefit from the latest technological developments that distinguish the ATR -600s with a modern avionics suite, superior cabin interiors, and enhanced engine performance. The aircraft will feature additional navigation capabilities including onboard reception functions needed for precision navigation and landing such as the Satellite Based Augmentation System (SBAS) and Localizer Performance with Vertical Guidance (LPV) capability. With over 260 ATRs in service in the liveries of more than 60 operators, Europe is ATR’s second largest market today. Since the beginning of the program, ATR orders in the region account for nearly 30 per cent of all ATR sales. Cebu Pacific is the launch customer for the new High Density ATR ‘-600′ cabin. Le Bourget, 16 June 2015 – The Philippines’ leading airline, Cebu Pacific Air (PSE:CEB), ordered 16 ATR72 -600 from ATR, the European Turboprop aircraft manufacturer. At the Paris Air Show, Cebu Pacific and ATR announced that the deal includes options to acquire an additional 10 ATR72-600, valuing the total aircraft order at US$673 million, based on current list prices. The order is part of Cebu Pacific’s fleet renewal program. Cebu Pacific currently operates a fleet of eight ATR 72-500 aircraft, which will be retired as the new aircraft enter service. 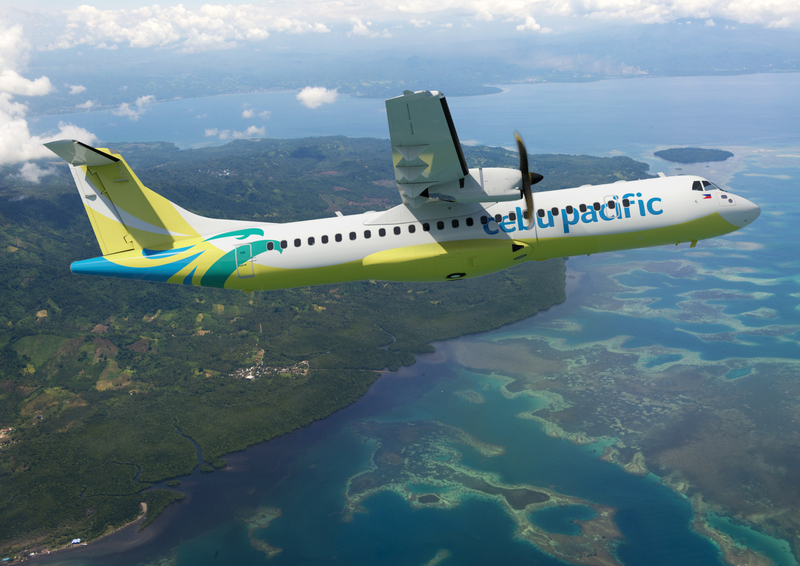 The entry into service of the ATR 72-600 will see Cebu Pacific double its Turboprop fleet with new generation aircraft to meet growing demand in the Philippines for inter-island service. ATR aircraft enjoy a high reputation not only for versatility but also for their ability to operate on short runways. This will allow Cebu Pacific to expand its operations not only on main airports but also to several other airports around the country, enabling Cebu Pacific to continue to play a leading role in the development of regional transport, tourism, and local economy in the Philippines. The ATR 72-600 ordered by Cebu Pacific will be equipped, for the first time, with the high density Armonia cabin, the widest cabin in the turboprop market. It will be equipped with 78 slim-line seats and wider overhead bins with 30% more stowage space. These new technological innovations further enhance space and comfort for passengers. About 330 ATRs – including more than 100 ATR 72-600s – are currently operated by 55 airlines in the Asia-Pacific region, where for many years now, are seen as the reference regional aircraft. The ATR 72-600 has the lowest seat per mile cost on the 70 seat segment, with significantly lower fuel and maintenance costs compared to similar class aircraft. Patrick de Castelbajac, Chief Executive Officer of ATR, declares to be “very happy to continue our partnership with one of the leading airlines in South-East Asia and to contribute to the expansion of its network throughout the islands of the archipelago”. Cebu Pacific will also be able to benefit from the vast support network for ATR operators in Asia. When their first ATR 72-600 arrives, there will be five ATR pilot training centers in the region”. LE BOURGET, France, June 16, 2015 /PRNewswire/ — Boeing (NYSE: BA) and SMBC Aviation Capital, one of the world’s largest aircraft lessors, announced an order for 10 737 MAX 8s today at the Paris Air Show. This deal adds to a 2014 order placed by the lessor for 80 737 MAX 8s for a total of 90 on order. The 737 MAX incorporates the latest technology CFM International LEAP-1B engines, Advanced Technology winglets and other improvements to deliver the highest efficiency, reliability and passenger comfort in the single-aisle market. The 737 MAX will be 14 percent more fuel-efficient than today’s most efficient Next-Generation 737s – and 20 percent better than the original Next-Generation 737s when they first entered service. Boeing has been doing business in Japan for more than 60 years, during which time it has built close and enduring partnerships with Japanese customers and industry partners. Japanese customers have purchased over 1,000 Boeing airplanes and Japan’s aerospace companies make a significant contribution to all Boeing commercial airplane programs: the 737, 747-8, 777 and 787, and now the 737 MAX and 777X. SMBC Aviation Capital has a modern fleet of over 370 owned and managed aircraft valued at more than $10.5 billion, which includes 180 Boeing airplanes. The leasing company has 95 airline customers and over 42 investors in more than 40 countries around the world. It is headquartered in Dublin and has offices in Tokyo, Shanghai, Beijing, Hong Kong, Singapore, New York, Amsterdam, Toulouse and Seattle. LE BOURGET, France, June 16, 2015 /PRNewswire/ — Boeing (NYSE: BA) and AerCap announced an order for 100 737 MAX 8s today at the Paris Air Show. The order, valued at $10.7 billion at current list prices, is the first 737 MAX order for AerCap. AerCap is a global leader in aircraft leasing with 1,800 aircraft that are owned, managed, or under contract to purchase. AerCap serves over 200 customers in more than 90 countries with comprehensive fleet solutions and provides part-out and engine leasing services through its subsidiary, AeroTurbine. AerCap is listed on the New York Stock Exchange (AER). PARIS (June 16, 2015) – Rockwell Collins’ PAVES™ Broadcast in-flight entertainment (IFE) and Airshow® 3D Moving Map systems will be featured on 15 new Next-Generation Boeing 737 aircraft on lease by China Eastern Airlines. Deliveries are expected to begin in late 2015. This is the latest in a series of selections by China Eastern for Rockwell Collins systems. Earlier this year, the airline selected the company’s Head-up Guidance System and Multi-Mode Receiver for 20 new aircraft. “We continue to strengthen our longstanding relationship with China Eastern and look forward to delivering our advanced systems for the flight deck and cabin,” said Jim Walker, vice president and general manager, International and Service Solutions, Asia Pacific for Rockwell Collins. Rockwell Collins’ PAVES Broadcast overhead IFE significantly reduces size, weight, and power consumption compared to previous overhead system offerings. The system’s High Definition Media Server (HDMS) offers 160 gigabytes of solid-state digital audio and video storage capability, integrated pre-recorded announcements, and music (PRAM) functionality with embedded Airshow 3D Moving Map. Rockwell Collins’ Airshow 3D Moving Map system includes NASA’s Blue Marble map data, based on actual satellite imagery, to provide a modernized view of real-time flight information to passengers. Extensive features and performance enhancements not only deliver unparalleled 3D graphical realism, but also add even more new capabilities to what is already the industry’s most popular moving map system. Additionally, with PAVES Broadcast, airlines have the option to handle updates of non-encrypted content themselves or through the Rockwell Collins Content Services Group. This choice gives airlines flexibility in responding to commercial opportunities as they arise, since time-sensitive content can be replaced at a moment’s notice, anywhere in the world. LE BOURGET, France, June 15, 2015 /PRNewswire/ — Boeing [NYSE: BA] and Qatar Airways announced an order for 10 777-8Xs and four 777 Freighters, valued at $4.8 billion at list prices, on the opening day of Paris Air Show 2015. “Acquiring technologically-advanced airplanes such as the 777X is integral to our expansion strategy,” said His Excellency Mr. Akbar Al Baker, CEO, Qatar Airways. “With the addition of these 777-8X to the 50 777-9X already on order, we are confident of continuing the tremendous legacy of the 777. The 777X builds on the passenger-preferred and market-leading 777, as well as offering more market coverage and revenue capability than the competition. The 777X will include new engines, an all-new composite wing and will leverage technologies from the 787 Dreamliner. The 777X family includes the 777-8X and the 777-9X, both designed to respond to market needs and customer preferences. The 777-9X will be 12 percent more fuel efficient than the competition, necessary in today’s competitive environment. The 777-8X is 5 percent more efficient than its competitor at all ranges while providing for new network opportunities. Design of the 777X is underway and production is set to begin in 2017, with first delivery targeted for 2020. With this order, the 777X has accumulated 320 orders and commitments from six customers worldwide. Boeing is the undisputed air cargo market leader, providing over 90 percent of the total worldwide dedicated freighter capacity. The 777 Freighter is capable of flying 4,900 nautical miles (9,070 km) with a full payload and general cargo market densities, making it the world’s longest-range twin-engine freighter. The airplane’s range capability translates into significant savings for cargo operators: fewer stops and associated landing fees, less congestion at transfer hubs, lower cargo handling costs and shorter cargo delivery times. The Execution of this contract follows to the successful cooperation of SCAC and Yakutia, which has been operating two SSJ100s through domestic and international routes since early 2013. The value of the new contract is nominated in Russian Rubles. «Entry into service of three more SSJ100 aircraft will allow the company not only to upgrade the fleet and expand the route network, but also to reduce the financial risks related to lease payments guarantee due to a fixed rate in Russian Roubles», – said Ilya Tarasenko, President of Sukhoi Civil Aircraft Company. “After more than two years of SSJ100 service in extreme climatic conditions of the northern region, with constant cooperation with the manufacturer and mutual proposals for improving the operation of the aircraft, Yakutia Airlines management and specialists recognize the Sukhoi Superjet 100 promising aircraft and can be considered for development of the Airline’s fleet”, – said Director General of Yakutia Airlines Olga Fedorova. GE Capital Aviation Services (GECAS), the aviation leasing and financing arm of General Electric [NYSE: GE] has announced a firm order for 60 A320neo Family aircraft including the A321neo at the 51st International Paris Air Show. GECAS has selected CFM’s LEAP-X engine for all 60 A320neo aircraft. The deal was jointly announced today by Norman C.T. Liu, President and CEO of GECAS and John Leahy, Airbus Chief Operating Officer, Customers. This new order brings the total number of A320 Family aircraft ordered by GECAS to 465, including 120 A320neo aircraft. Le Bourget, 15 June 2015 – Spain’s Canary Islands airline Binter today signed an agreement for the purchase of additional six new ATR 72-600 aircraft, following their first batch for six ATR 72-600s in February 2014, bringing total orders for ATR aircraft to thirty. The new ATR order is a part of the Binter’s fleet modernization and network improvements program. By progressively replacing its current fleet of aging turboprops with the modern and fuel efficient ATR-600s, the airline will significantly reduce operating and maintenance costs, gain further in profitability and offer more comfort to its passengers due to its enhanced seats design. Deliveries of the 72-seat ATR-600 aircraft commence this year and will be completed by 2017. Binter currently operates a fleet of 16 ATR 72-500s.